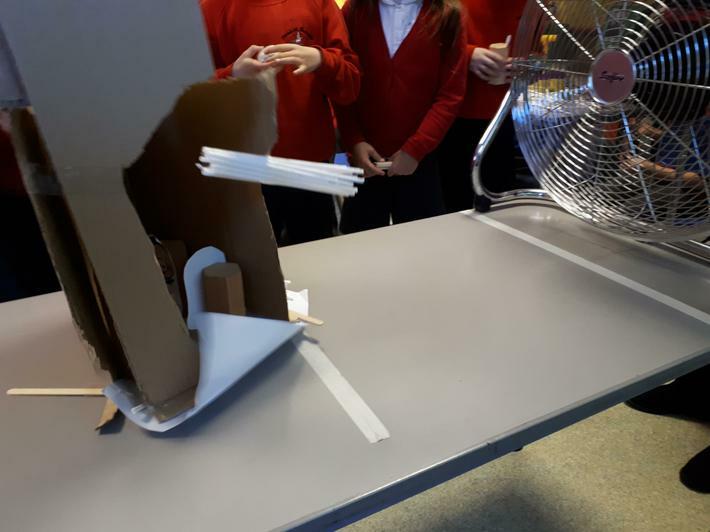 At Bridekirk Dovenby we aim to make science practical and fun. We aim to deliver lessons filled with experiments, getting children involved in planning them, identifying variables, executing them with accuracy, reading the results and evaluating them. 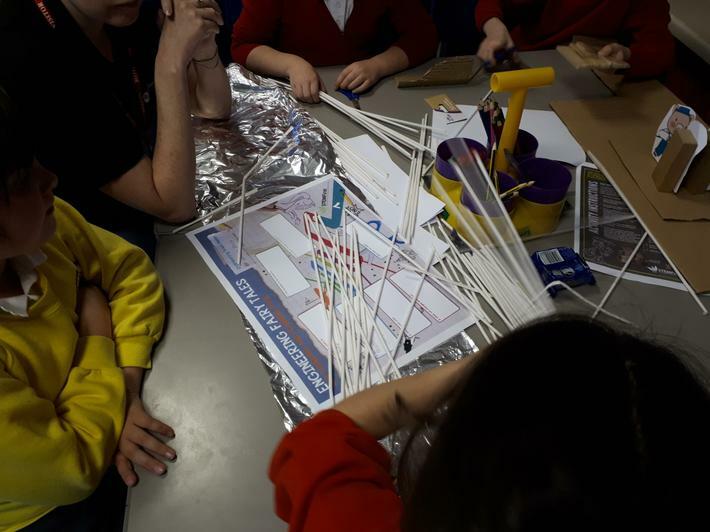 We believe that children learn best from doing real experiments and learning about science in the real world. As teachers we are constantly working to ensure that acitivities and experiments deepen children's understanding of each scientific topic. We always research our lessons thoroughly to make sure we have the most up-to-date subject knowledge to pass on to our Little Scientists. We look for opportunities to bring outside agencies into school as much as possible. 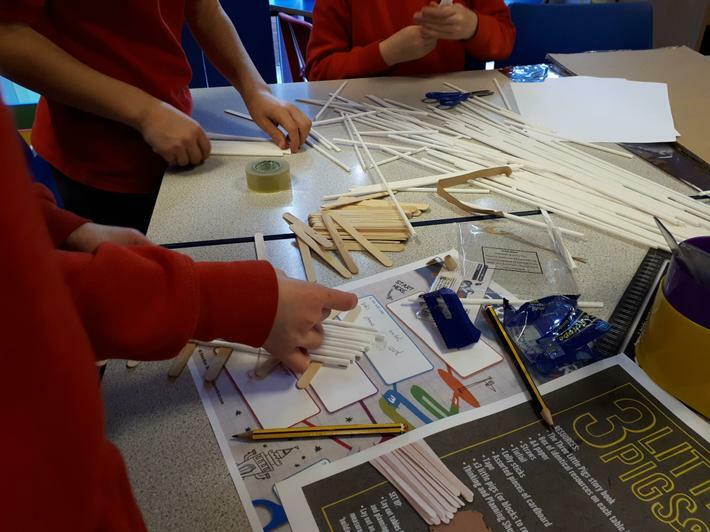 We regularly have work with STEM to cover many areas of new technology such as robotics and coding. 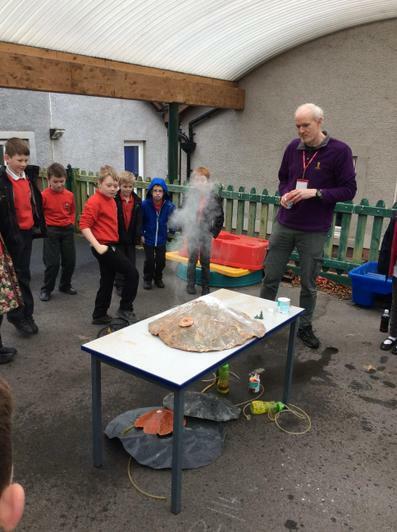 We have also had visits from geologists and zoologists! Exciting News for budding scientists! In summer term we will be running a Science Club for Reception, Year 1 and Year 2 pupils. 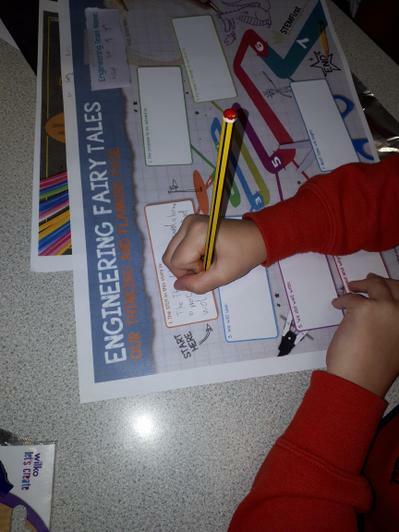 We will be deepening our knowledge of lots of different scientific ideas and doing some very interesting experiments! This year we have been working VERY hard competing in the Cumbria branch of Lego League. We had to learn lots about robotics, coding, giving presentations and researching different problems faced by those travelling in space. We though thtat people on long space missions would really miss their family and thought of different ways we could create a Virtual Reality contact system relayed by satalites in space. On the day we had to use a single code to drive a robot around different Lego obsticles. There were lots of rules and we did very well. Year 3 had a very special visitor this week showing us lots of different rocks and soils. We then went outside and made our own volcanic erruptions! At Bridekirk we are very in touch with nature and we love learning about plants and animals. 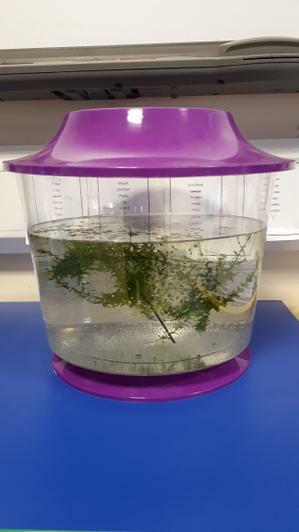 Primary Three have their own Frogspawn which we are studying as part of the Year 4 Animals and their Habitats module. We are going to research exactly what our Future-Frogs will need in their habitats during the different stages of their life-cycle: Are the needs of a tadpole the same as the needs of a frog? Note: The tadpoles will be released back into the exact pond they came from! Year 4 have been learning about how to look after teeth. We discovered that the shell on the outside of eggs is very similar to the enamel on our teeth. So, we put some eggs (hard boiled!) in different types of liquid. 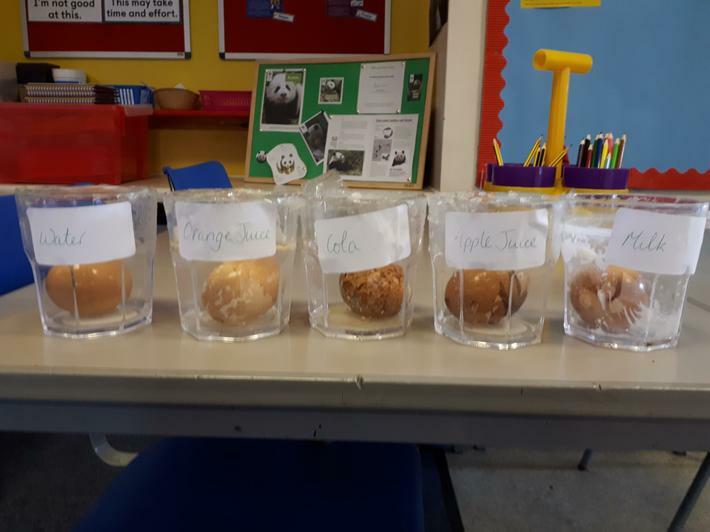 We watched the eggs over a number of days and recorded any changes to the surfaces of the eggs. We found that the egg in the orange juice had the most damage to the surface. We thought very hard about what was different about the orange juice and came to the conclusion that it was the highest in sugar of all of our drinks. This led us to believe that drinks such as orange juice would be the worst for our teeth out of the selection. Moral of the story: if you have to drink sugary drinks, always use a straw! In this particular experiment we were testing different conductors and insulators. 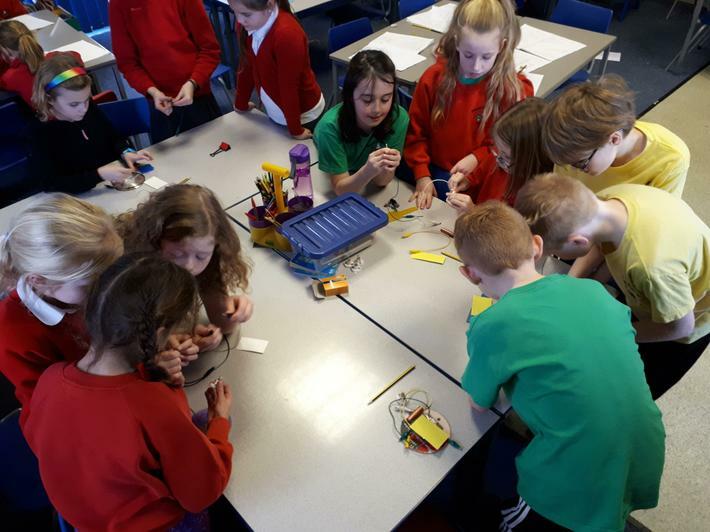 We then tried to group different objects into conductors and insulators and then used these to make predictions about whether the next object would be a conductor or an insulator. In the bottom left group, all of their metal objects so far had be great conductors, would their metal key be the same? This week we had a visit from ZooLabs. We had a fantastic time seeing different animals, learning lots of things about them and how they are adapted to survive in their different habitats.